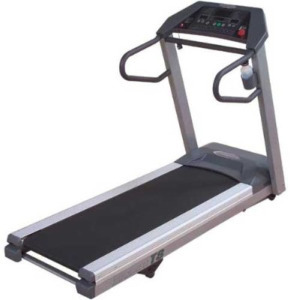 The Endurance T8-HRC treadmill is made by Body Solid, a leading strength training equipment company. Geared toward the mid-priced treadmill market, the Endurance line has achieved mixed results. The Endurance T8-HRC treadmill’s console display has a profile matrix LED which shows feedback on Time, Distance, Speed, Heart Rate, Elevation, and Calories. The Pre-set Programs include Heart Rate Control (HRC), Endurance, Running, Interval, Cardiovascular, Walking, Custom Learner, Distance, Calories, Time, Fat Burn, and Manual. Unit Dimensions — 77" x 32" x 57"
The Endurance T8 HRC comes with 2.5" crowned rollers and a heavy-gauge welded steel frame with textured powder coat finish. The 2.8 HP continuous duty motor is protected by P.W.M. (Pulse Width Modulation) technology and is air-cooled for efficient performance. The low maintenance and reversible phenolic treadmill deck has a SRS (Suspended Running Surface) design and a 6-point shock absorption system. There was a recall on four Endurance models in 2006: the T7, T7.1, T8, and T9.1, for problems with unexpectedly acceleration and deceleration. The company slogged on but most treadmill reviews are reluctant to give the Endurance T8-HRC good marks. Otherwise, the model is above average in many other aspects, especially in the quality parts, which are backed by a lifetime warranty. The Endurance T8-HRC has some health club-style features including a roomy walking area, quiet and powerful motor, superior cushioning, and a great warranty. The recall is a black mark, however, and we feel you should weigh your options carefully before paying nearly $2,000 for this Endurance treadmill. There are a number of other treadmills that cost less and have better features – for example, the Livestrong 16.9T treadmill at $1,699 or the Sole S77 for $1,899 just to name two. Both treadmills have made several “Best Buy” lists, offer good value and reliability, larger motors and user capacities, and are backed by outstanding warranties. We would pay less and buy a Sole or a Livestrong before we would buy the Endurance T8-HRC treadmill.